These gorgeous-looking cupcakes are by Jamieanne of The Sweetest Kitchen (via Flickr). These are banana cupcakes with shredded coconut. They are frosted with creme fraiche frosting, which hides a hidden pocket of coconut caramel sauce. 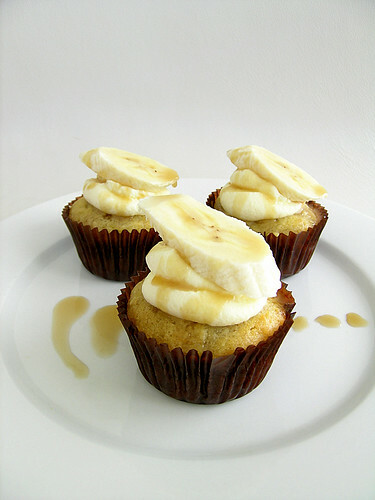 On top is a sliced banana and the cupcake is drizzled in the coconut caramel sauce.